If you are considering an environmental master’s degree, drop by 231 Forsyth on September 18 anytime between 9:00am-11:45am. 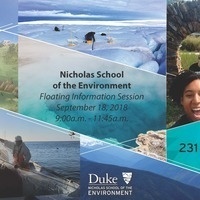 With the Master of Environmental Management and Master of Forestry degree programs, Duke University’s Nicholas School offers the best of both worlds: the practical nature of a professional degree, combined with the specificity of an MS degree. Benjamin Spain, Associate Director of Enrollment Services, will be discussing these programs and will answer any questions you may have.